When I think of Valentine’s Day, I immediately think of all things red velvet. 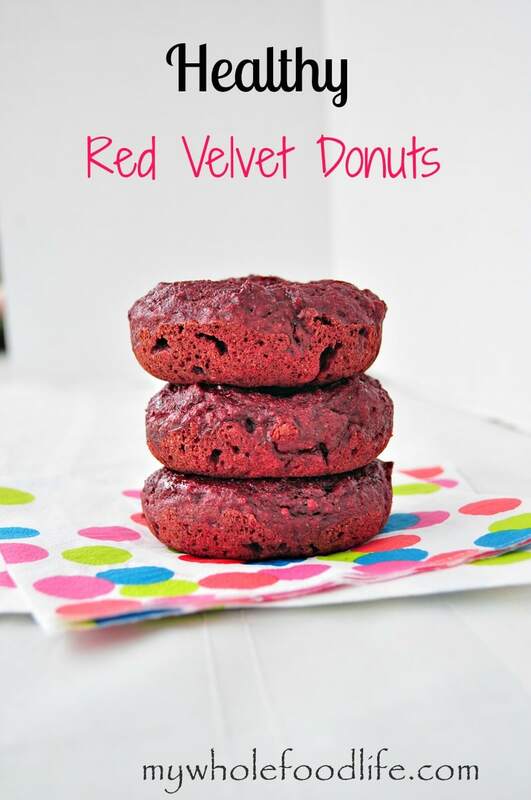 Last year for Valentine’s Day I made my girls these Healthy Red Velvet Donuts. Since I didn’t use food coloring, my donuts didn’t have that deep red color you associate with all things red velvet. Well this year I have made a gluten free red velvet donut recipe that contains a secret ingredient to make them deep red. Not only are these deep red in color, but this recipe is also a clever way to get more veggies into your kids without them knowing it. My kids will eat almost anything in donut form and they gobbled up these red velvet donuts. They had no idea that beets were on the ingredient list! This recipe makes a smaller batch so you are not stuck with a lot of donuts in the house. The perfect Valentine's Day breakfast! Mix all the dry ingredients in one bowl . Spoon batter into greased donut pans . Let donuts cool completely before removing from the pans. If you don't have a donut pan, you can also make these into muffins. They will need to cook an extra couple minutes though. I juiced a beet to make beet juice. If you don't have a juicer, you can blend up a beet and then strain it to make the juice. Made these this morning in my mini donut pan. Got 2 dozen out of the batch. The flavor is good - would be great with a glaze or something. But the texture is a bit chewy. Is that from the oat flour? Maybe next time I'd use whole wheat pastry flour or something. Thanks for the recipe! It could be the oat flour. A glaze on these sounds good too! I am not sure how to make one though. Simply powdered sugar and milk. I usually blend up cane sugar to a fine powder and add milk and vanilla. Could sweeten with maple syrup if needed. sounds delish! Can I sub coconut palm sugar for the maple syrup? Thanks! Thanks! I think you could. You may need to add a touch more liquid if you do though. What's the best way to store these if eating 2 days after making them? That look delicious! Thank you! I store them in the fridge for up to 2 weeks. You can also freeze them.